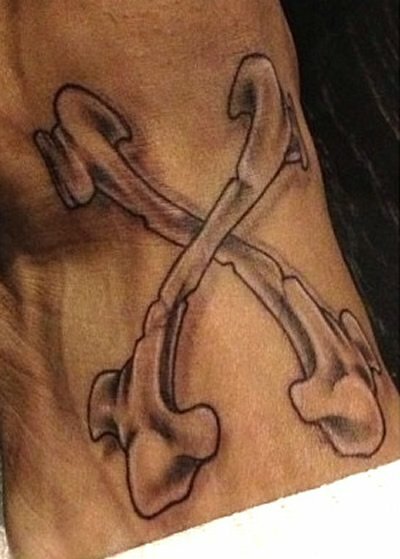 Chris Brown Gets an “X” Tattoo on His Foot, Crossbones Style! X marks the spot, and, for Chris Brown at least, the spot appears to be on his foot. The singer debuted yet another new tattoo on February 28, and the ink consists of two bones criss-crossed to form an “X.” We know, we know. Chris Brown makes the third pop star in just one month to get a “X” inked on their body – a trend that was started by Miley Cyrus when she got her crossed arrows tat on February 1, and continued by Justin Bieber when he revealed the Greek “X” symbol on his arm earlier this week. We’ll address the possible implications of this “X” tattoo obsession in another post (Illuminati ties?? 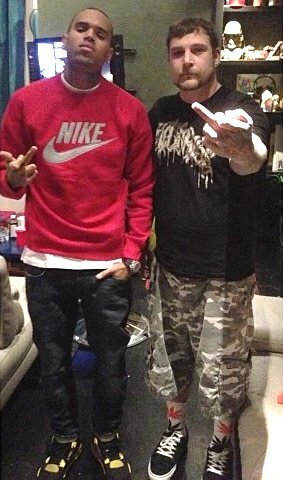 ), but for now, let’s focus on Chris Brown’s foot ink and the likely meaning of the crossbones tattoo. Chris Brown’s latest tattoo was inked in L.A. by celebrity tattoo artist John Petro, and is located on what looks like the top of his foot and ankle. The tat follows a message posted by the singer last November that said “New album coming soon! X!!!!!!!!!!!!!!!!! !” along with a picture of a sketch of the letter “X.” As you may have already guessed, Breezy has a new album coming out this year, and the possible titles have been rumored to be either Carpe Diem – which is the name of his tour – or simply X. Now that Chris Brown has actually inked the letter “X” on his body, we’re going to go ahead and assume that he’s chosen his album title (and artwork?) and is ready to wear it proudly. This isn’t the first time Chris Brown has gotten an album title tattooed on his body. He also has a large piece on the underside of his right bicep that reads “FAME,” an acronym for “Forgive All My Enemies,” which was also the title of his fourth studio album. Breezy obviously favors symbols and acronyms for his album titles – just to keep it interesting – since the title of his 2012 album Fortune was written across the album cover in hieroglyphic symbols. We’re not sure yet why Chris Brown chose to title his upcoming album “X,” but we’re certain it’s going to be a good one – the singer is currently recording material with Timbaland, Diplo and Danja. And now that he’s let us in on the album title with his crossbones foot tattoo, we are really looking forward to its release!